What a weekend, I do not remember the last time I actually had a weekend where I wasn’t running from place to place. This was my idea of the perfect weekend. After the week that I had at work, this was exactly what I needed. I am not heading into the work week stressed and behind at home – I am actually well rested and caught up. Wow. And, it only gets better from here – the next few weekends are the same. There is nothing on the calendar – nothing at all. I am loving this summer already. So – what did I do with all my time? Most of it was spent on food, in some way or another. Saturday morning we went to the University Farmer’s Market – and since it was warm and sunny, so did the rest of Seattle. It was packed, but fortunately we were there early enough to still get some really good stuff. We bought a beautiful looking brisket and pork tenderloin from our favorite folks at Skagit River Ranch, some amazing chive cheese from this local creamery (wish I could remember their name! ), Japanese cucumbers that I turned in these today, and some amazingly fresh asparagus. The girls each picked out a pastry from the Russian lady as well. Then on the way home, we stopped at my favorite fruit stand for some more of those delicious strawberries – I just can’t get enough of those. I was set for a Sunday in the kitchen. If you read my blog regularly, you know that I love asparagus – it is so versatile, and beautiful at the same time. 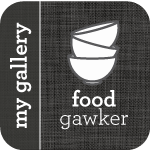 One of my favorite Seattle restaurants just released a cookbook – Lark – Cooking Against the Grain – I actually haven’t purchased it yet, but it is on my list. Fortunately I am on their mailing list, and as luck would have it – they sent a recipe this week for Asparagus with Lemon and Brown Butter. It seriously took me about 10 minutes to make, and who doesn’t love brown butter on just about anything? This dish was fantastic – and I probably didn’t even need to peel the stalks, but it definitely gives it a finished look. The dish looked wonderful next to our smoked brisket at dinner tonight. Here’s to a perfect summer weekend…a food filled weekend of shopping, cooking and eating! Trim off the woody ends of the asparagus. Peel the asparagus from about an inch below the tip to the end. In a pot of salted boiling water, blanch the asparagus until just cooked. Shock in an ice-bath to stop them from cooking any further. Remove the asparagus from the ice-bath to a plate to let them dry, or you can pat them dry with a paper towel. Add the butter to a medium sauté pan and cook over a medium heat until it is golden brown and nutty. It will be quite foamy as it browns. Add the asparagus to warm through. Add the lemon juice and season with salt and freshly ground black pepper. 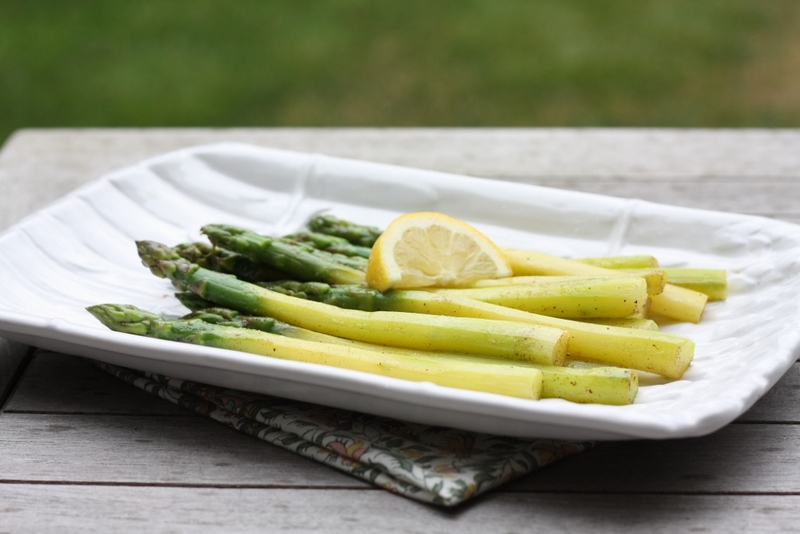 Place the asparagus on a serving platter and dress with the extra brown butter from the pan. Serve warm. I love when someone trims the ends off my asparagus. It makes me feel so loved and cared for and to wrap them up in a simple brown butter sounds delicious. I am so happy to hear you can have some down time over the weekends and going to the farmers market is one of my favourite activities. My boys have their last day of school this Friday so looking forward to having a few Sundays without homework. Asparagus is one of those veggies that the kids and I will eat and not complain about. I wouldn’t say we love it, but we eat it. Mike on the other hand could eat it all day long. He will love this! And maybe it will turn one of the kids into a fan one of these days too. Glad your summer off to a good start. :) It feels good doesn’t it!